Max for Live, included with the Suite version of Ableton’s DAW and available separately for Standard edition owners, puts one of the most powerful visual audio and MIDI programming environments money can buy, Cycling ’74’s Max, right at the heart of your production system. 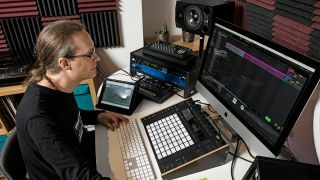 As an inevitable consequence of its remarkable depth, Max For Live isn’t exactly easy to use, which is where this Max for Live masterclass comes in. First up we have Ableton Certified Trainer Phelan Kane who will walk you through the process of creating your first Max for Live device: a simple digital distortion effect called Computer Music Degrader. Now that you have become familiar with the MFL ecosystem, it’s time to incorporate your new-found skills with your own productions. In this second video, Ableton’s very own Jesse Abayomi has created a full track made entirely of Max for Live devices and will show you how the whole thing was created. If you’d like to find out more, check out issue 264 of Computer Music magazine and issue 335 of Future Music magazine, which are both on sale now.